Cost Price (CP) : The price at which an article is purchased is called the cost price of the article. Selling Price (SP) : The price at which an article is sold is called the selling price of the article. 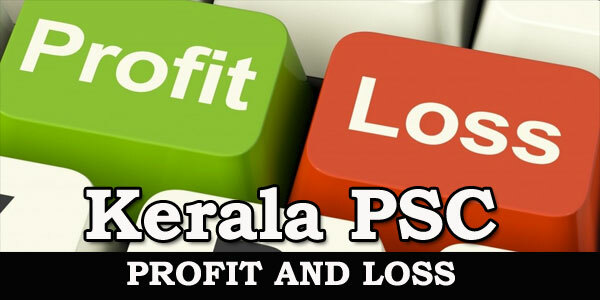 Profit or Gain : If SP is greater than CP, the seller is said to have profit or gain. Loss : If SP is less than the cost price, the seller is said to have a loss. Loss or gain are always reckoned on cost price. Profit on 100 is Profit Percent. 1. Raju purchased an item for 8200 and sold it at the gain of 25%. From that amount he purchased another item and sold it at the loss of 20%. What is his overall gain/loss? ∴ There is neither gain nor loss. 2. A man makes a profit of 10% by selling a radio for 495. What is the cost price of the radio? 3. If the cost price of 11 shirts is equal to the selling price of 10 shirts. Find the percentage profit or loss? 4. If a commodity is sold for 8100, there will be a loss of 10%. At what price should it be sold to make a profit of 10%? 5. A shopkeeper buys two TV sets of the same type. He sells one of them at a profit of 20% and the other at a loss of 5%. If the difference in selling price is 700, find the cost price of each TV set. 6. A shopkeeper bought a bicycle for 600 and sold it for 720. Find the gain percent. 7. A television set is sold at 12000. If its cost price is 10000. What is the profit%. 8. The cost price of an article is 200. It is sold at 12% of profit. What is the selling price? 9. Ramu purchased an Air conditioner for 12000 and sold it for 15000. What was the profit percentage? 10. A man buys a table for 1500 and then sells it for 1600. Find his profit percentage?